Early in his career, New Orleans Saints running back Mark Ingram struggled with durability. In his first five NFL seasons, Ingram missed three-plus games four times. Playing a full 16-game slate in back-to-back seasons, Ingram has been one of the most productive running backs in the league. Most probably don't realize just how good he's been. Of the 28 running backs with 1,000-plus combined rushing yards over the past two seasons, Ingram has a league-best 4.98 yards per carry. Kansas City's Kareem Hunt, who led the NFL in rushing last season as a rookie, has the second-best YPC (4.88) within that group. Four-game suspension a blessing in disguise? Set to miss the first four games due to a PED suspension, Ingram obviously won't extend his streak of 16-game seasons to three. But in some cases, bad news can be good news. Not that the suspension in and of itself is good news, but it could be a blessing in disguise. In other words, fantasy football is a weekly game and the suspension creates an enormous discount for high-level production from Weeks 5 to 16. Even though Ingram's suspension will open up additional opportunities for the team's second-year standout Alvin Kamara, the duo performed at such a high level last season. Kamara finished as a top-four fantasy running back (PPR's RB3) and Ingram still finished sixth overall. Based on my fantasy football projections, Ingram is 12th amongst running backs in terms of fantasy points per game. For only the second time in 11 seasons, Drew Brees threw less than 600 pass attempts in 2017. The other time during that span was 2009, their Super Bowl-winning season. The Saints ranked 13th in rushing play percentage (43.63%) in 2017. That compares to just 36.56% (fifth-least) in 2016. Given the team's talented backfield duo, it's unlikely that the Saints deviate much from last year's balance. In addition, Ingram (71) and Kamara (100) accounted for nearly 32 percent of the team's targets. Per PFF rankings, the Saints had the ninth-best offensive line in the NFL last season. They wrote in their analysis: "The offensive line was also effective on zone runs as Saints’ backs averaged 2.56 yards before contact on inside zone runs (second in the NFL) and 1.80 yards before contact on outside zone runs (fifth)." Of his 13 carries inside the five-yard line last season, Ingram converted those opportunities into eight touchdowns -- only Gurley (nine) had more. Le'Veon Bell, Latavius Murray, Devonta Freeman and Leonard Fournette were tied for third with six rushing touchdowns from inside the five. Based on the fantasy points allowed to opposing running backs last season, Ingram and the Saints' running backs have the 10th-most difficult strength of schedule for Weeks 1 to 16 in 2018. Unfortunately for Ingram, the schedule is more favorable during his suspension (18.48 PPG allowed during the first four games) vs. Weeks 5 to 16 (17.72 PPG allowed). In terms of the fantasy playoffs, it's a middle-of-the-road (15th-most difficult) schedule with matchups against Tampa Bay, Carolina and Pittsburgh from Weeks 14 to 16, respectively. 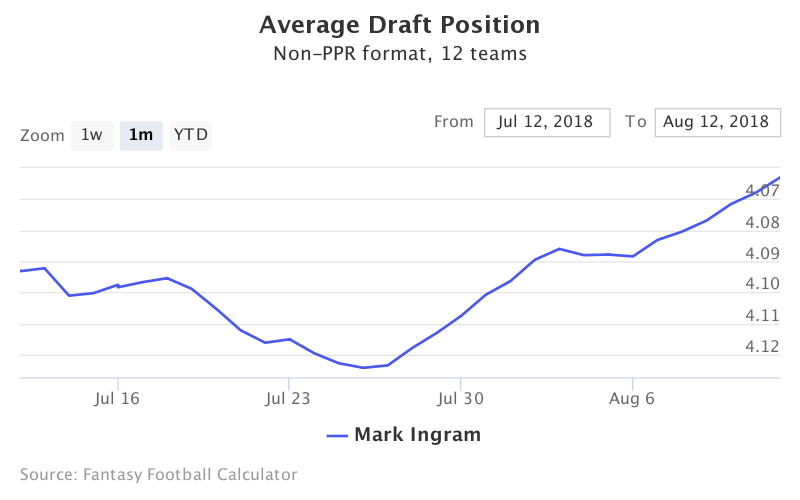 Ingram's ADP continues to steadily rise, as he was going a half-round later just a couple of weeks ago, but he still offers plenty of upside at his current ADP (RB23, 4.06). In many of the Fantasy Football Mock Drafts that I've completed recently, Ingram is often available in the fifth round (or even later). As noted above, Ingram ranks 12th in terms of projected fantasy points per game among running backs. Given his drop in ADP due to the suspension, he's essentially a low-end RB1 at the cost of a low-end RB2 beginning in Week 5. Considering that only two teams -- Carolina and Washington -- have byes in the first four weeks, it shouldn't be too difficult to find a viable RB2 to plug into your lineups over the first four weeks. Especially in standard-sized leagues (12 teams) where six teams make the playoffs, the discount more than compensates for the missed time early in the season.